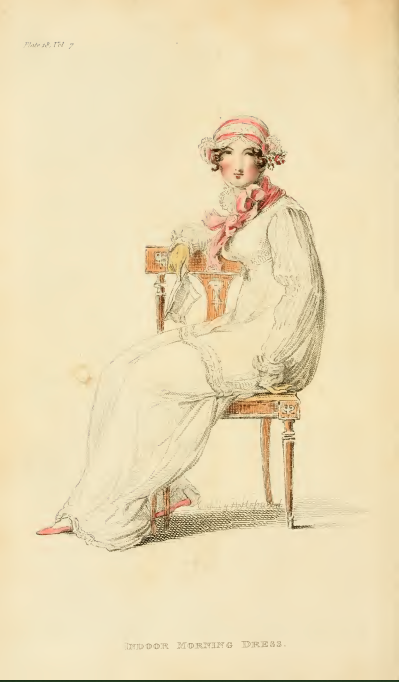 Springtime brings thoughts of babies and motherhood, and thus we have yet another fashion plate featuring a young child. 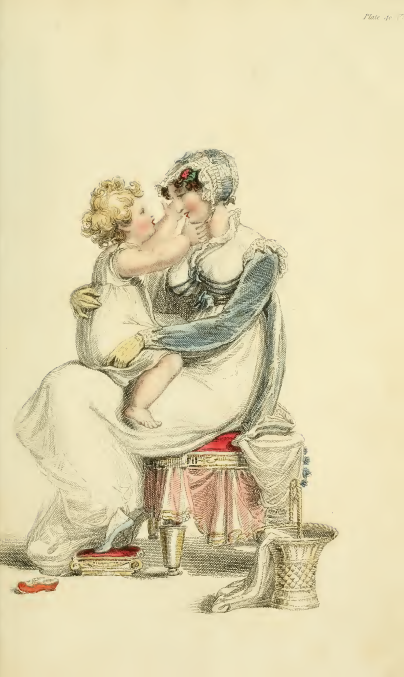 Unlike many earlier Ackermann fashion plates that include children, the toddler in this plate features so large as to almost obscure the details of the fashionable dress its mother is wearing. Strangely, mom is wearing gloves (of fashionable lemon) while interacting with her child! 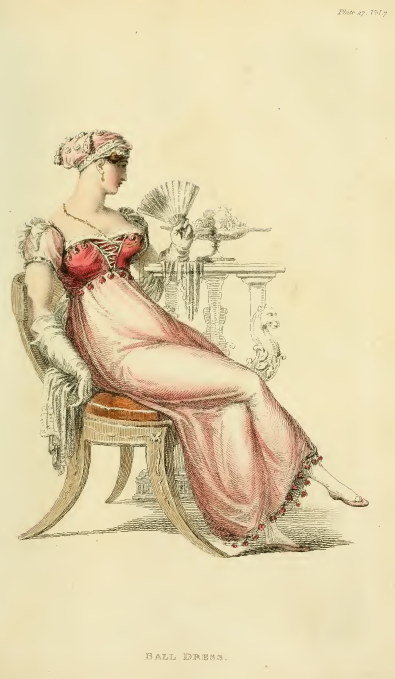 Baby has lost its little red shoe; can mother’s “small sprig of geranium placed in the hair on the left side” be far behind? 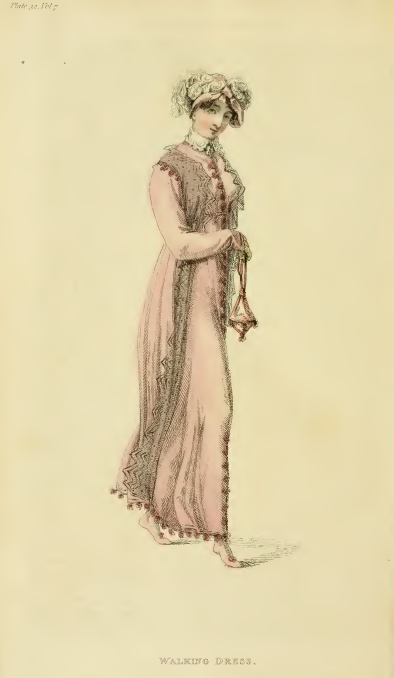 This month’s first fashion plate looks almost as if it had been made over from last month’s ball gown, with its “blossom-colored” sarsnet, and its trim of “tufted Chinese silk” all down the front and about the hem. But this dress is meant for walking, not for dancing. 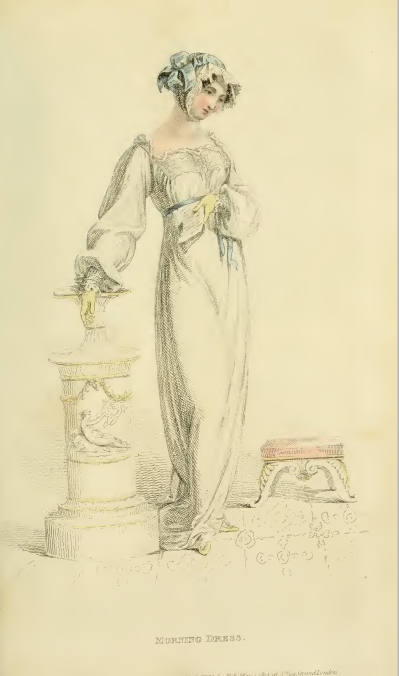 The second plate, featuring a “Morning Dress,” looks quite fancy for casual letter writing or reading, in which the model in this plate appears to be absorbed. 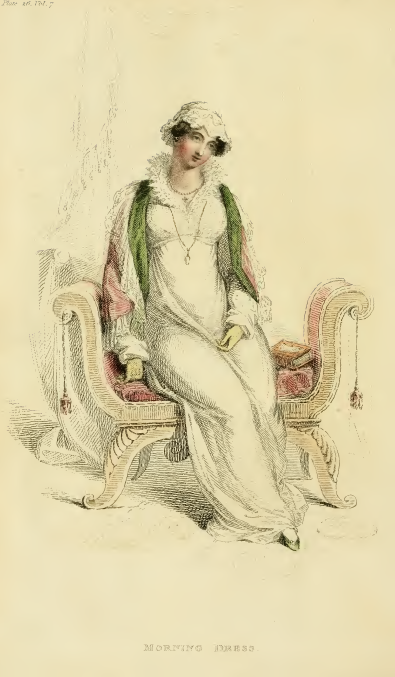 The lemon-colored kid gloves strike my eye as rather odd, but perhaps the celestial blue of the hat and waist ribbons was not an option for gloves? 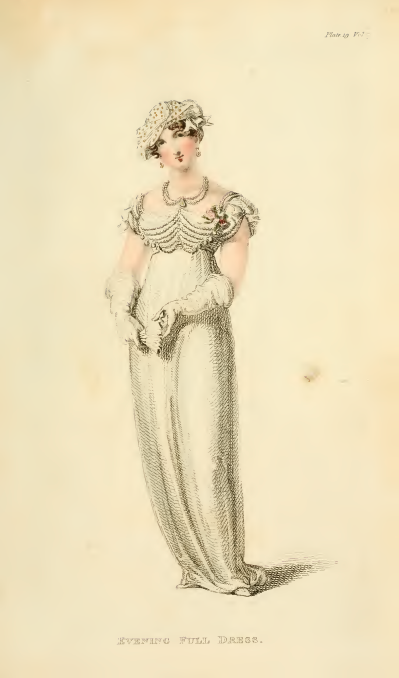 April 1812’s fashion plates feature a “Morning Dress” and a “Ball Dress,” both topped by the loveliest of headgear. 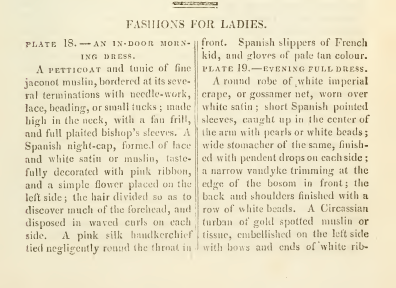 For casual wear, a “Flora cap” of white satin and lace; for evening occasions, a “Spartan or Calypso helmet cap of pink frosted crepe, with silver bandeaus, and embellished with tassels, and rosets” to match those on evening gown. 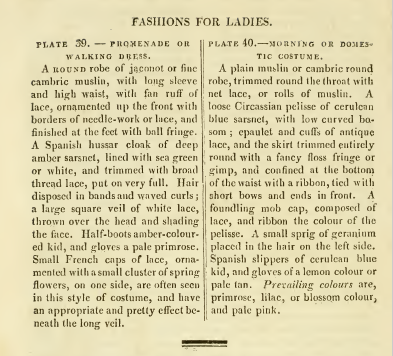 Did those tassels and rosets make a charming tinkling noise when my lady took to the dance floor, I wonder? 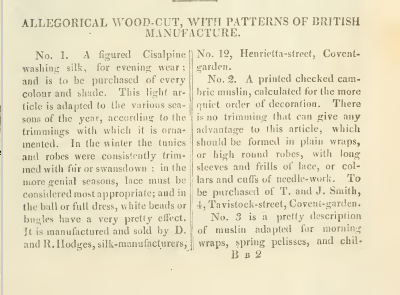 Before reading the description, I assumed the fabric in sample #1 & #2 was meant for a lady’s gown. 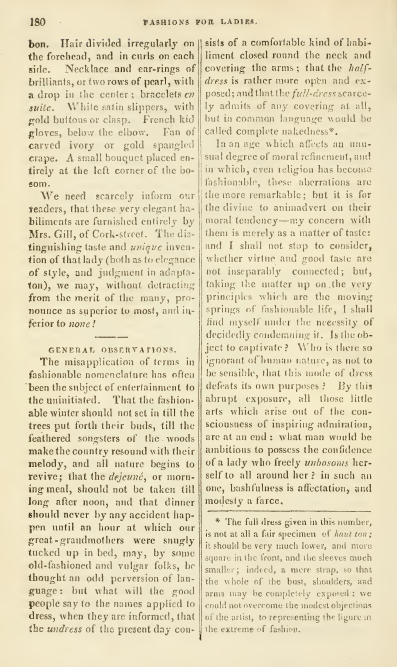 But to my surprise, I read that it is intended not for women, but for gentlemen’s waistcoats. 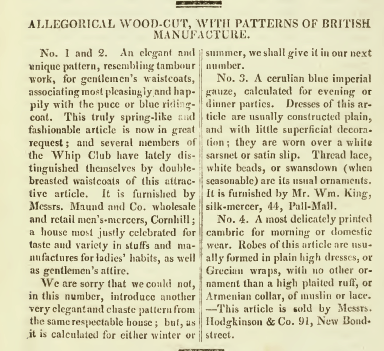 A popular item, it would seem, especially among members of the “Whip Club,” who “distinguished themselves by double-breasted waistcoats of this attractive article.” As the fabric resembles “tambour work,” or what appears to be embroidered netting, it seems a rather delicate choice for hard-driving bucks. 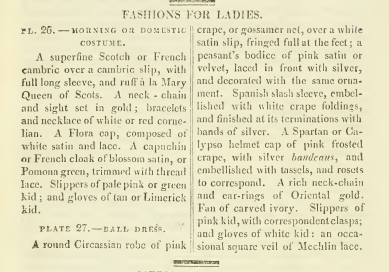 But perhaps that is part of the appeal: a true pink of the ton would be able to handle his horses so smoothly that there would be no danger of tearing the fabric of his oh-so-fashionable waistcoat. 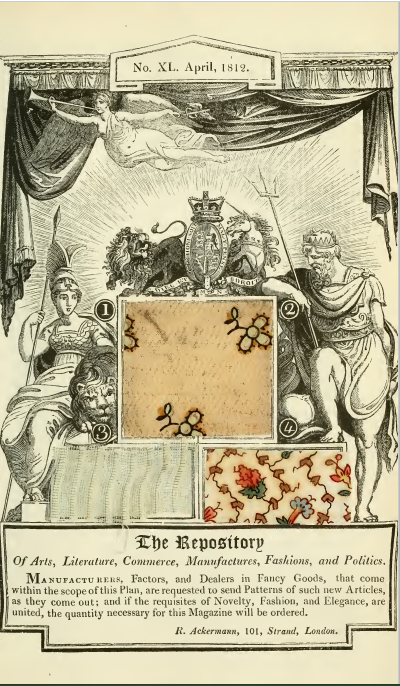 An extra plate this month, featuring an engraving of a “Ladies’ toilette dressing-case.” Equipped with not one, not two, but five separate mirrors, the dressing-case allows his owner to judge the success (or failure) of a particular hairstyle or dress adornment “more quickly and accurately than is possible with the usual accommodation.” I wonder how much Mssrs. 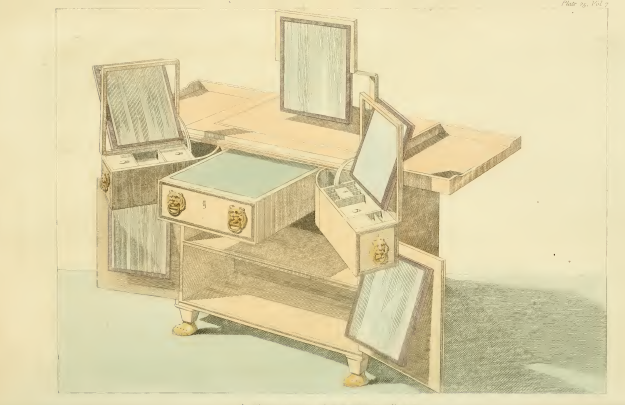 Morgan and Sanders charged for such an extravagant piece of fashionable furniture? 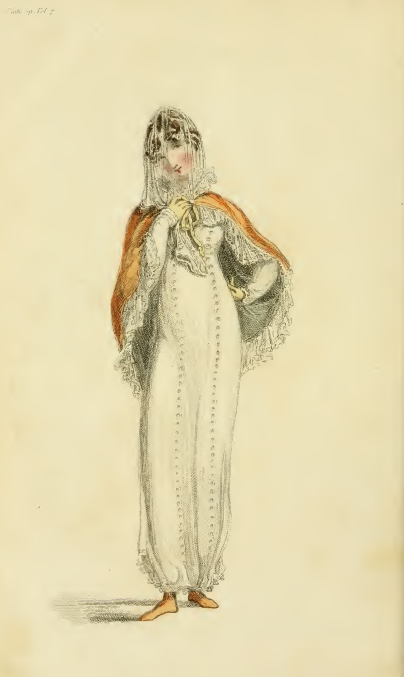 White, enlivened by touches of pink, are the colors featured in Ackermann’s March 1812’s fashion plates, which depict an “Indoor Morning Dress” and an “Evening Full Dress.” I wonder if the pearls (or, for the more frugal lady, white beads) adorning the stomacher of the evening dress sat heavily on one’s chest? 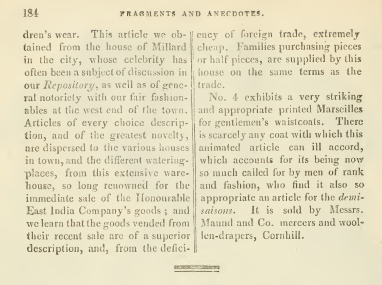 I’m struck by this month’s fabric sample #4, a “very striking and appropriate printed Marseilles for gentlemen’s waistcoats.” According to Fairchild’s Dictionary of Textiles, a “marseilles” is “a double-faced cotton quilting that is made in a plain jacquard weave with a raised, woven pattern…. 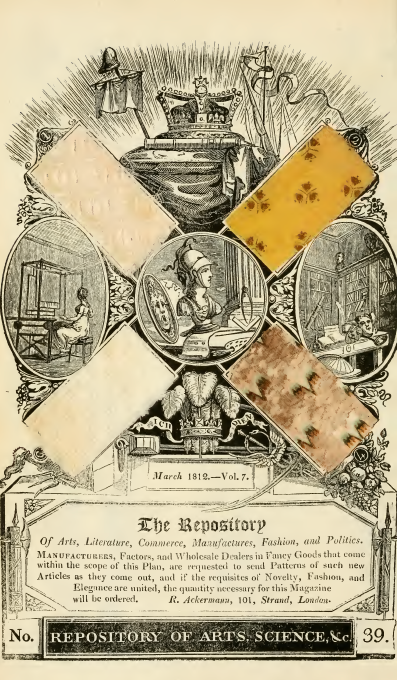 Usually it is made with two sets of filling one fine and one coarse, and one fine warp. 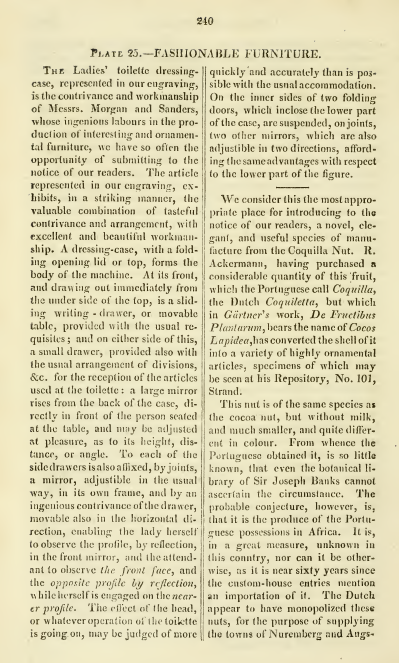 The plain ground is composed of the fine yarns, the coarse ply filling the floats to form the raised figures” (347). I’m wondering if the brown dye of the raised figures (which have a flavor of native american bird motifs, to my eye) have bled, making the plain ground appear mottled.